A scanner shouldn’t just be a box that moves paper around. Banking requirements evolve and today’s hardware must be designed to anticipate those changing needs. With simple intuitive controls, multiple capture functions, and modern advancements the Digital Check TS500 was engineered to meet your needs today… and tomorrow. The revolutionary design of the TS500 feed system combines an innovative roller design with advanced feeder intelligence to virtually eliminate mis-feeds and skewing of items during the scanning process. The AccuTrac transport system is standard on every TS500 and an optional AccuTrac Plus feeder module is available where large volume batches benefit from additional document handling assistance. Each TS500 has a special path for capturing images of ID cards, debit cards or driver’s licenses. A new 600 dpi camera does it all with extra precision. An optional magstripe reader can be used for additional validation or transactional purposes. 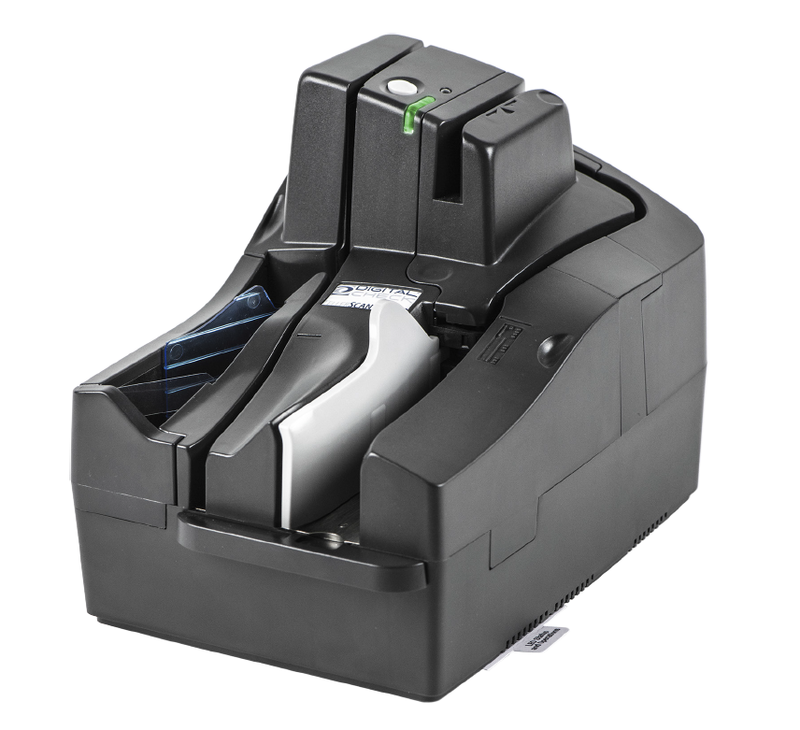 A new drive belt system helps make the TellerScan TS500 our quietest multi-feed scanner ever. Noise levels test more than 50 percent lower than competitive models employing individual drive motors. If “speeds and feeds” are your thing, the TellerScan TS500 has enough to handle any job you throw at it. With a rated speed of up to 200 documents per minute (DPM), it handles teller-window duty with ease, while having enough horsepower to replace high-end batch capture scanners used at the branch back counter. The TS500 is the first scanner with a built-in cleaning utility that makes maintenance a snap. Activate the cleaning mode, and our patented AccuTrac feeding system automatically holds the cleaning card against the feed rollers with the right pressure and for the correct amount of time to ensure that you have properly performed maintenance. No more manual attempts and guesswork. New roller materials help maximize the amount of time between cleanings while a handy indicator light alerts the user when maintenance time is approaching.